Goal: This project provides assistive devices to older adults that help them eat with dignity. Many seniors have difficulty eating for a variety of reasons: tremors from Parkinson's Disease, paralysis or weakness from stroke, pain from arthritis are some examples. Often, they cannot prepare their own food or feed themselves. A caregiver is sometimes required to help feed the senior. Because of the indignities of having to be fed or of making a mess, the person will not eat in front of others, isolating themselves. Or because of the challenges, they are not getting enough food into them. These devices allow them to eat with dignity, thereby increasing their nutritional intake, independence and quality of life, improving their nutritional status and reducing their nutritional risk. 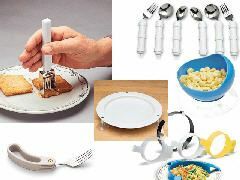 Examples of devices include weighted silverware and cups to settle tremors, curved silverware to help with range of motion limitations, built up silverware to help with gripping, suctioned plates to keep the plate on the table so they it doesn't fly off and spill the food, lipped plates to help with scooping food without spilling. Some of these items could be expensive and unaffordable. Funding will provide devices to those who need them.